A couple of years ago this blog shared the story of the taser-killing of Anastasio Hernandez, an undocumented person who was caught, handcuffed, surrounded and then tortured by US Border Patrol agents. The story took another twist when a new video emerged that gave a fuller view of the torture endured by Mr. Hernandez. Sometimes we lose the human side of these stories. I imagine that some felt justification in this taser-torture once they learned that Mr. Hernandez was in the country illegally. However, the other side of the story is that he was a hard-working father of five who was loved by his family and respected by his neighbors. I remain convinced that something is wrong with the taser policy or training currently in place with America's law enforcement officers. Is it just me? 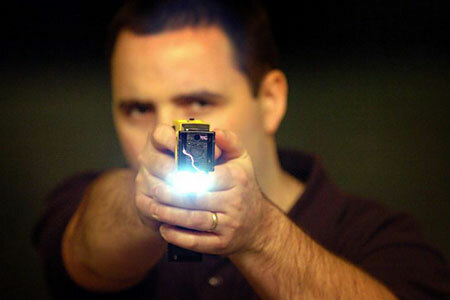 Or do you have similiar thoughts about taser use in our nation? Sadly, another death by tasering this week. A 25 year old male, Anthony Demery, was tasered to death in the Natchitoches Parish Detention Center. This is "under investigation." An autopsy is underway. His mother, Margaret Demery, was given no information about her son's condition by the detention center. R.I.P. Anthony, a tragic loss.